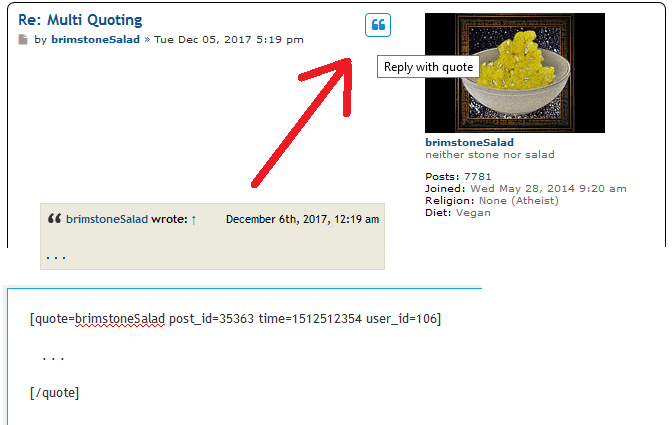 How do I separate quotes in a reply/response? Surround the text you want to quote with a quote tag. Daz wrote: How do I separate quotes in a reply/response? If you spell the username correctly, the user will be alerted that you quoted him or her. I often copy+paste to username to make sure it's right and I didn't make a typo. This way you can quote multiple users in different places, or break down a comment to respond to it part by part. Aha. It might be the user_id part that makes it show up.